The Wilson Hall Cafe accepts Visa, Master Card, Discover and American Express. Dr. Kurubarahalli Saroja has joined the Northern Illinois University Institute for Neutron Therapy at Fermilab (NIUINT at Fermilab) staff. She worked at the Neutron Therapy Facility between 1985 and 1993 and will now be assisting and advising Dr. Katherine Baker, the facility's new medical director. Both are members of the Nuclear Oncology Service Corporation, which agreed to provide clinical services beginning December 2005. 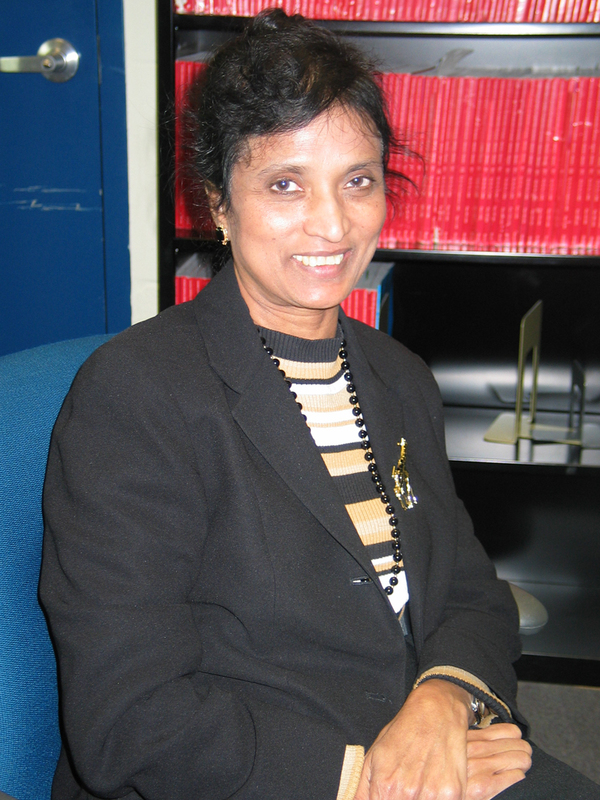 Throughout her career, Dr. Saroja has made an effort to remain involved in both neutron radiation and conventional photon and electron radiation therapies. Although she was not involved in the first ten years of the neutron therapy facility's clinical trials, she still recalls doing research and publications during her prior stint there. Eventually her interests drew her back to conventional radiation. "I didn't want to miss out on the regular radiation therapy," says Dr. Saroja, "so I went back to that field. Now I do both." She says she has seen great advances in the field of (conventional) radiation oncology in the past ten years, which include Intensity Modulated Radiation Therapy (IMRT) and more recently, Image Guided Radiation Therapy (IGRT). Such technologies enable doctors "to visualize , plan, and target the tumor exactly and give the right radiation dose," explains Dr. Saroja. In her free time, Dr. Saroja enjoys reading, writing, traveling and watching classic movies. She writes in both English and her native language, Kannada, a south Indian language. Jane Austen movies (Pride and Prejudice, Sense and Sensibility) and Gone with the Wind top the list of her favorite classics. On certain summer days when the sun is out, you can see them at the Frelo Field across from Pioneer Cemetery, navigating tiny airplanes in loop-de-loops half-way up the troposphere. They're the Barnstormers, Fermilab's model airplane club, and this Wednesday they'll be hosting an event in a much smaller venue. 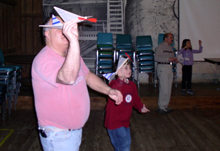 At the annual "Delta Dart Night" in the Kuhn Barn on March 8, the Barnstormers will help guests construct, fly and compete model planes powered by rubber bands. 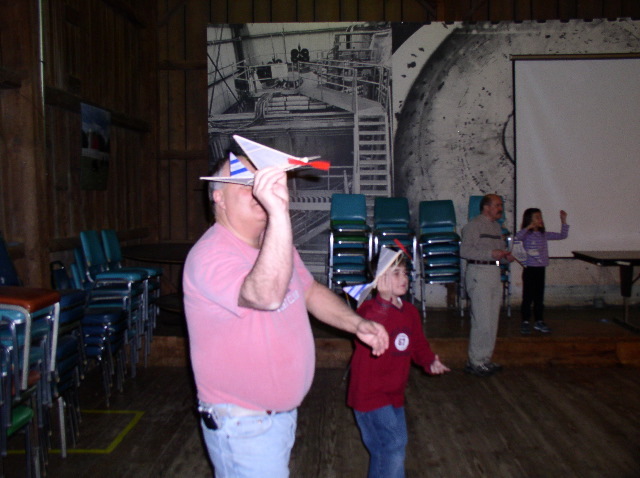 The event starts at 5:30 p.m., and participants will have about 45 minutes with balsa wood, tissue paper and rubber bands to build their own model airplane for endurance flying inside the barn. "We'll be looking for the longest flight," said Barnstormer Secretary, Andreas Jansson of the Accelerator Division. "The lucky planes won't hit the beams." Jansson says that even if you've never made a paper airplane, it's not a problem. Novices will be stepped through the process of making the light little aircraft. "Everyone and their grandmother is welcome," he said. "It's especially fun for kids." The Barnstormers meet on the second Wednesday of each month and are always looking for new members. You can learn more about them here. CHICAGO, March 6 (UPI) -- The record-breaking performance of Fermilab's Tevatron collider near Chicago is pushing the search for dark matter and extra dimensions to new limits. Scientists at the Department of Energy's Fermi National Accelerator Laboratory in Batavia, Ill., say by repeatedly smashing peak luminosity records, the Tevatron has created record numbers of proton-antiproton collisions that provide the means to unveil the secrets of the universe. Jonathan Dorfan, Albrecht Wagner, Shekhar Mishra and Bob Kephart have been meeting with Indian scientists as well as Government representatives to describe the opportunities that exist for collaboration on the International Linear Collider. We all hope that India will become a key partner in this global collaboration. In a visit to the Inter-University Accelerator Center here in Dehli, directed by Professor Amit Roy, we were able to see the facilities for the development of Super Conducting RF cavities, including electron beam welding and electropolishing facilities that are state of the art. A visit with the leader of Delhi University, Professor Deepak Pental, showed us the broad support for science and for collaboration that exist at the highest level of that institution. Delhi University has a stupendous number of students: 270,000 who attend classes and 300,000 who take courses through the web. Professor Ram Shivpuri is a long time collaborator of Fermilab--20 University of Dehli PhDs in particle physics have been minted in his group from his participation at Fermilab. At the Department of Science and Technology, which is roughly equivalent to the NSF, we met with the Secretary, Professor V.S. Ramamurty. His broad advice was to make the collaboration on ILC relevant not only to the discipline of accelerators in India, but more broadly to the spectrum of capabilities that Indian Universities can bring in science, engineering and information technology. 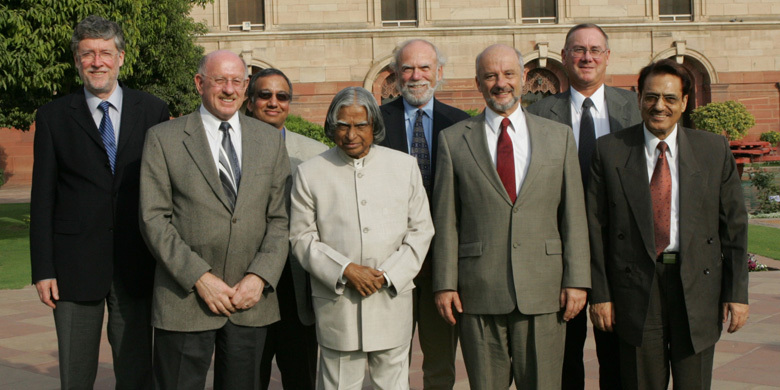 Earlier today we met with the President of India, Dr. Abdul Kalam, himself a distinguished scientist and engineer. He was interested in and supportive of the basic science goals of the ILC, but he also wanted to know the possible practical applications for India that would ensue from the ILC accelerator R&D. In particular, he mentioned that, in seeking energy independence, India is interested in exploring accelerator driven fusion in a Thorium cycle (Uranium supplies are limited while Thorium supplies are abundant in India). Just as the Proton Driver at Fermilab would use an ILC linac for most of the needed acceleration, so could the ILC technology be relevant to very high intensity neutron sources needed for the development of this technology. We will be exploring these ideas further in visits to the Center of Advanced Technologies (CAT) in Indore, and the Department of Atomic Energy (DAE), the Tata Institute of Fundamental Research (TIFR) and the Bhaba Atomic Research Center (BARC) all in Mumbay. We will also have further opportunities to discuss the ILC and other collaborative projects with our Indian colleagues in Bangalore where both the LCWS06 and GDE meetings are taking place. We are learning a lot about this vast and astonishing country, and we are optimistic that a great collaboration will develop on the ILC as well as other projects relevant to Fermilab. Scottish Country Dancing will meet today, March 7, at Kuhn Barn on the Fermilab site. Instruction begins at 7:30 p.m. and newcomers are always welcome. Most dances are fully taught and walked through, and you do not need to come with a partner. Info at 630-840-8194 or 630-584-0825 or folkdance@fnal.gov. VMS is shifting labor resources to cover the services we provide with a reduced production team. We now ask that all duplication jobs be submitted through the Visual Media Service customer service desk located in Wilson Hall ground floor northwest. We will no longer staff Duplicating for walk-in business. This will mean more lead time for projects. We appreciate as much lead time as you can give us. Our normal turn around is 5 working days on all jobs. We have had this in place for 15 years. If something needs to be completed in a rush please let us know and we will determine if we can meet that deadline. Fermilab Folk Club Barn Dance Sunday, March 12 at 6:30 p.m. with music by Joe Samojedny and Friends and calling by Paul Watkins. More info on the website. Classes are added weekly. To see the current professional development schedule, visit the website.